It has a simple aim: complete the course as fast as you possibly can. The paddler with the fastest time down the river is declared the winner. For many wild-water racing is a way to get close to nature and see the rivers of Ireland. For others wild-water racing offers a chance to push themselves physically in white-water. This includes the excellent opportunity it offers for cross-training for paddlers in other disciplines including canoe-polo, marathon, sprint, freestyle and slalom. 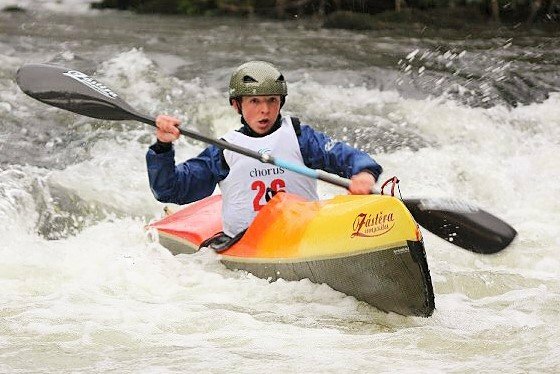 Wild Water Racing is an exciting form of canoeing & kayaking which sees competitors race down stretches of rough river negotiating rapids, weirs, trees and rocks in time trial format. It is the canoeing equivalent of downhill skiing. Races consist of two types. The sprint event where competitors race twice down a stretch of rough water approx. 500 metres in length, with the times of their two runs combined to count towards the race result. The classic event where competitors race once down a stretch of rough river between 2 kms and 8 kms long. In both event types, the competitor with the fastest elapsed time is deemed the winner. It is a true test of a paddler’s speed, strength, stamina and skill. Wild Water Races in Ireland run from typically early October until the end of March, taking advantage of the usually wet months to swell the rivers.